Hard anodized cookware is a kind of cookware that makes use of aluminum, which has undergone the process of anodization. This process involves submerging aluminum into a sulfuric acid bath before exposing it to minimal electrical charges. The product is aluminum oxide which comes from aluminum combined with oxygen. From here, cooling the sulfuric acid to 32?F follows before increasing the electrical charge. The end result is what is called “hard anodized” aluminum. The process is quite extensive but it is able to give aluminum cookware great advantages that in turn prove beneficial to any cook. A lot of people find themselves concerned about the safety of anodized aluminum in cookware. Being a heavy type of metal, aluminum that is used for the storage of food could seep into food, which could be a risk to safety. As a matter of fact, aluminum can be found in almost anything, including table salt, foil, cookware, and even antacids. Nowadays, aluminum cans usually have a plastic layer, so as not to allow food to be contaminated with aluminum. Should a tiny amount of aluminum enters into the bloodstream, it will not be dangerous. When it comes to the best hard-anodized aluminum cookware, “AboutEnvironment” assures that it is in fact much safer than the stainless steel types. This is because the process it goes through keeps the aluminum locked in so that it does not penetrate food. Additionally, this type of cookware has no reaction to acidic types of food. Food is able to sear in the shortest amount of time because anodized cookware is highly conductive. Anodized cookware is lightweight and easier to handle. Cleaning is not a problem. This is because food barely sticks to the surface of the pans. Anodized cookware is very durable and resistant to the usual dents and scratches. Corrosion is not a problem either, which means that metal spoons and others can be used without fear of damaging the surfaces of the pans. Unlike other types of non-stick coatings, hard anodized aluminum does not peel or chip. Anodized cookware can be used for electric, ceramic, and gas stoves. 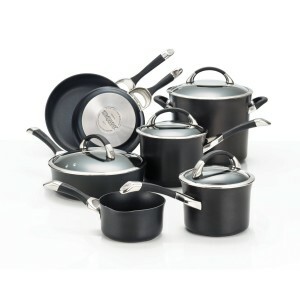 Most of the anodized cookware sets feature interiors that are non-stick. The surface of this type of cookware is nearly non-porous, making food a lot more resistant to the problem of sticking. The anodized aluminum cookware surfaces are harder than stainless steel, making it the strongest type of cookware in the market at present. Hard-anodized cookware is more expensive than the regular type of non-stick cookware. When cooking, high heat must be avoided as it quickly absorbs heat. This type of cookware, just like any other type of non-stick cookware, is not dishwasher-friendly. They must be hand-washed to keep them well-maintained. It is also best to avoid using abrasive sponges that could damage the pan’s surface. Hard-anodized cookware is not compatible with induction stoves. This is because this type of stove needs magnetic referral on the bottom part. Completely non-stick, provides even heat, strong and durable, safe in a dishwasher. Additionally, they look very nice too. This line is compatible with glass and ceramic induction too. When variety is the spice of life, have the right professional quality pans on hand to create favorite recipes. This set provides the essential pots and pans any kitchen needs. Make a mushroom and spinach melange in the covered saute while rice or polenta gently simmers in a saucepan and tasty salmon filets finish off in the skillet. Savor the perfect lentil soup as it cooks to perfection in the generously sized stockpot. With this cookware, the possibilities are endless. Versatile and sophisticated, Circulon Symmetry cookware combines high-technology performance with an elegant tulip shape to provide great durability, exceptional heat conduction and a beautiful look. It features the TOTAL Food Release System of circles to reduce surface abrasion coupled with DuPont Autograph advanced 3-layer nonstick both inside and out, to deliver extraordinary food release and easy cleanup – and it’s metal utensil safe. Constructed of durable heavy gauge hard-anodized aluminum, Circulon Symmetry is fitted with an impact bonded stainless steel base suitable for all stovetops, including induction. The tempered glass lids with wide stainless steel rims allow you to monitor the cooking process without lifting the lids, keeping flavor and moisture in. Graceful cast stainless steel handles are enhanced with silicone to provide a confident grip. This cookware is dishwasher safe and oven safe up to 400 degrees Fahrenheit. Features a stylish bronze finish and is completely durable and strong. Its full non-stick surface allows easy cooking even without adding oil. Grips remain cool, are not too heavy or too light, and have glass lids that are break-resistant. Can work well for up to 400 degrees in an oven. Inspired by the great French kitchens, Cuisinart began making professional cookware over 30 years ago. Constructed of the finest materials available, to perfectly perform all of the classic cooking techniques. Designed to last a lifetime, Cuisinart cookware makes family meals memorable and entertaining a pleasure. Savor the Good Life right at home, with family and friends. Cuisinart makes it absolutely delicious. Designed from the inside out for today’s lifestyles, our Non-Stick Hard Anodized Cookware combines uncompromising superior cooking performance with a professional look. Cuisinart Non-Stick Hard Anodized Cookware exterior is harder than stainless steel for durability and professional performance. 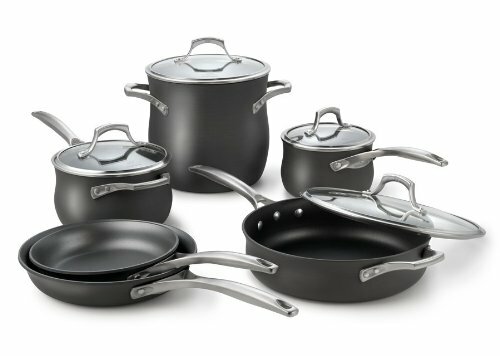 We guarantee a lifetime of healthy cooking with Cuisinart Chef’s Classic Non-Stick Hard Anodized Cookware. 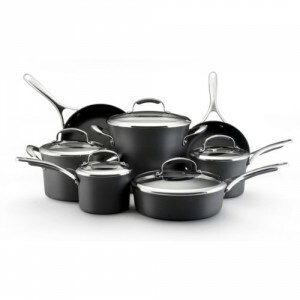 Chef’s Classic Hard Anodized 14pc. Set: A deluxe cookware set that will meet all of your needs. The 14-piece set contains an assortment of pots, pans and steamer inserts. At last, nonstick cookware that lets you cook like a professional. Two surfaces make the difference. The revolutionary Slide Nonstick surface releases foods effortlessly, essential for creating tender omelettes and delicate sauces. And a specially textured Sear Nonstick surface that seals in flavor to create juicy braised beef, tuna and vegetables. Each surface is designed to enhance the specific cooking purpose of the pan. So your mushroom-gruyere omelette is moist and flavorful and your salmon filets are seared to perfection. The perfect pair – in one set. Free your culinary spirit with Calphalon Unison Nonstick. This cookware set is an exceptional value, including all of the pans needed to equip your kitchen with the most used cooking pieces. As the set contains only basic pieces, you’ll really use each and every pan. It includes saucepans for whisking a homemade sauce or cooking your morning oatmeal, a big stockpot for soups, stews or boiling pasta, and skillets (probably the most used pan in any kitchen) that will help you turn out perfect crepes or a simple grilled cheese sandwich. The set also includes a saute pan, a wide, straight-sided pan that can perform many of the functions of a skillet but features deep sides for extra capacity, perfect for one dish meals. Start your dish in this pan by sauteing onions and browning meat, then add your liquid and other ingredients into the same pan to finish on the stovetop or in the oven. A perfect starter set that has all the essential features. Great for daily cooking and has a non-stick surface, making for easier cleaning too. The line can accept 400 degrees F of heat with even cooking has tight-fitting glass lids and features a good coating of anodized aluminum. It is also lightweight, making it easier for non-professionals to handle with ease.